Twenty-five years ago this month, I sat across from Ronald Reagan in Reykjavik, Iceland to negotiate a deal that would have reduced, and could have ultimately eliminated by 2000, the fearsome arsenals of nuclear weapons held by the United States and the Soviet Union. The next few years may well determine if our shared dream of ridding the world of nuclear weapons will ever be realized.Critics present nuclear disarmament as unrealistic at best, and a risky utopian dream at worst. They point to the Cold War’s “long peace” as proof that nuclear deterrence is the only means of staving off a major war. As I, along with George P. Shultz, William J. Perry, Henry A. Kissinger, Sam Nunn, and others, pointed out five years ago, nuclear deterrence becomes less reliable and more risky as the number of nuclear-armed states increases. Barring preemptive war (which has proven counterproductive) or effective sanctions (which have thus far proven insufficient), only sincere steps toward nuclear disarmament can furnish the mutual security needed to forge tough compromises on arms control and nonproliferation matters. The trust and understanding built at Reykjavik paved the way for two historic treaties. The 1987 Intermediate-Range Nuclear Forces (INF) Treaty destroyed the feared quick-strike missiles then threatening Europe’s peace. And, in 1991, the first Strategic Arms Reduction Treaty (START I) cut the bloated US and Soviet nuclear arsenals by 80% over a decade.But prospects for progress on arms control and nonproliferation are darkening in the absence of a credible push for nuclear disarmament. I learned during those two long days in Reykjavik that disarmament talks could be as constructive as they are arduous. By linking an array of interrelated matters, Reagan and I built the trust and understanding needed to moderate a nuclear-arms race of which we had lost control. Reykjavik proved that boldness is rewarded. 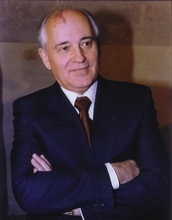 Conditions were far from favorable for a disarmament deal in 1986. Before I became Soviet leader in 1983, relations between the Cold War superpowers had hit rock bottom. Reagan and I were nonetheless able to create a reservoir of constructive spirit through constant outreach and face-to-face interaction. A first step would be for the US finally to ratify the 1996 Comprehensive Test Ban Treaty (CTBT). President Barack Obama has endorsed this treaty as a vital instrument to discourage proliferation and avert nuclear war. It’s time for Obama to make good on commitments he made in Prague in 2009, take up Reagan’s mantle as Great Communicator, and persuade the US Senate to formalize America’s adherence to the CTBT. This would compel the remaining holdouts – China, Egypt, India, Indonesia, Iran, Israel, North Korea, and Pakistan – to reconsider the CTBT as well. That would bring us closer to a global ban on nuclear tests in any environment – the atmosphere, undersea, in outer space, or underground. A second necessary step is for the US and Russia to follow up on the New START agreement and begin deeper weapons cuts, especially tactical and reserve weapons, which serve no purpose, waste funds, and threaten security. This step must be related to limits on missile defense, one of the key issues that undermined the Reykjavik summit. A fissile material cut-off treaty (FMCT), long stalled in multilateral talks in Geneva, and a successful second Nuclear Security Summit next year in Seoul, will help secure dangerous nuclear materials. This will also require that the 2002 Global Partnership, dedicated to securing and eliminating all weapons of mass destruction – nuclear, chemical, and biological – is renewed and expanded when it convenes next year in the US. Our world remains too militarized. In today’s economic climate, nuclear weapons have become loathsome money pits. If, as seems likely, economic troubles continue, the US, Russia, and other nuclear powers should seize the moment to launch multilateral arms reductions through new or existing channels such as the UN Conference on Disarmament. These deliberations would yield greater security for less money. But the buildup of conventional military forces – driven in large part by the enormous military might deployed globally by the US – must be addressed as well. As we engage in furthering our Conventional Forces in Europe (CFE) agreement, we should seriously consider reducing the burden of military budgets and forces globally.